Gosh, it just came to my realisation that the last Nails Talk update was in January! I'm still very much in love with nail polishes and am still painting my nails (though as frequent). Just that most updates were done on my Instagram cause I simply didn't have the luxury of time to sit down and write a blog post. High time to revive Nails Talk and today I have another beauty from one of my favorite indie nail polish brand, Pretty & Polished to kick start the revival. 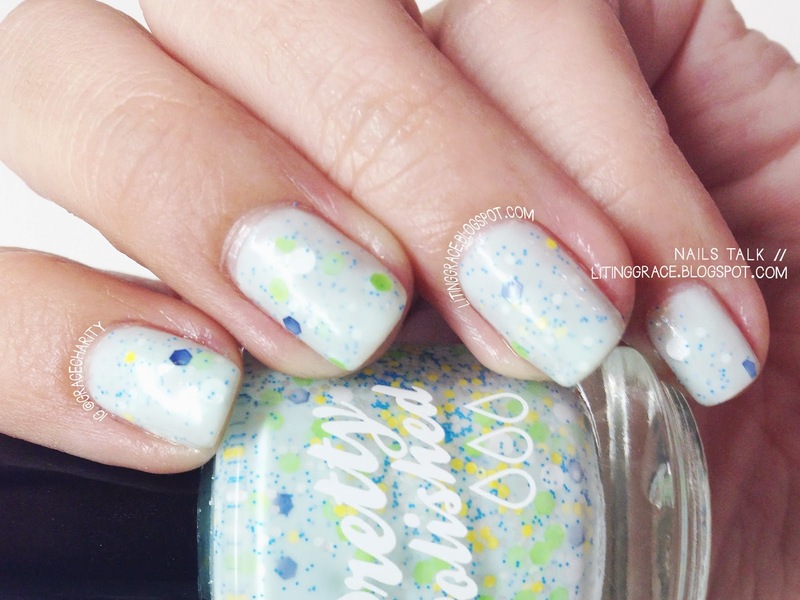 Ma Ma Ma My Fionna from the "A New Equation" collection (an extension to the Adventure Time themed blends) is a light blue crelly polish packed with white, blue, green and yellow glitters to remind you of the beautiful and brave Fionna from Adventure Time. Swatches above show two coats of Ma Ma Ma My Fionna topped with one coat of top coat. Formula was great and application was easy, however I did had to fish for the bigger glitter pieces. I would recommend turning the bottle upside for a while before use. The last I checked, this is unavailable at Pretty & Polished web-store, but no worries. This and many more is available at Mei Mei's Signatures, so do pop over and take a look! Don't forget to follow Pretty & Polished and Mei Mei's Signatures on their respective Facebook page and Instagram account for updates and info on new collections/ colors.